On September 8, 2015, the feast day of the Vladimir Icon of the Mother of God, a very special event took place in the life of the Western American Diocese. His Holiness Irinej, Patriarch of Serbia, visited the Diocesan Cathedral of the Mother of God dedicated to Her Icon “Joy of All Who Sorrow” in the company of many Serbian Orthodox bishops, clergy, seminarians from the theological seminary in Prizren and others. As the 45th Patriarch of the Serbian Orthodox Church, his full title is His Holiness the Archbishop of Pec, Metropolitan of Belgrade and Karlovci, Serbian Patriarch Irinej. As a young man, upon completing his theological education and military service, His Holiness was tonsured a monk in 1959. He then became a professor at the Theological Seminary in Prizren, and later its rector, in the meantime completing post-graduate studies in Athens. His Holiness was consecrated an auxiliary bishop of Moravica in 1975 and soon after that was elected Bishop of Nis. After heading that diocese for 35 years, he was elected Patriarch of the Serbian Orthodox Church in 2010. As part of his visit to the United States of America, His Holiness arrived at the cathedral to venerate the honorable and miraculous relics of Holy Hierarch John of Shanghai and San Francisco the Wonderworker. Patriarch Irenej was greeted by His Eminence Archbishop Kyrill of San Francisco and Western America, the diocesan clergy and faithful. After his entry into the altar, the chanting the augmented litanyand the singing of “Ton Despotin,” by the Cathedral Choir, Archbishop Kyrill gave a warm welcome to His Holiness, expressing his sincere joy at this visit and recalling the strong filial and historical bond between the Serbian and Russian peoples. At the conclusion of this greeting Archbishop Kyrill conferred upon His Holiness the Western American Diocesan Order of Saint John of the 1st Degree. Your Holiness, this day is a special feast for us Russians in that you and other Serbian Archpastors have come to visit us. Your presence here reminds us about how not so long ago the Serbian Church saved the Russian Church during its exile. You accepted us and our leader, Metropolitan Anthony (Khrapovitsky), Patriarch Gavrill and later Patrirarch Dimitri adopted us and with their love extended to us shelter at that time in Yugoslavia. King Alexander I of Yugoslavia especially consoled Russians within his Kingdom. It was Pascha in the 1930s when the king visited Russian churches and gave the Paschal greeting. And a Serb asked him, “Your Excellency, why did you visit the Russian first and the Serbs after?” And the king answered, “my friend, they do not have a Father,” that is their Emperor. He was like a father and embraced Russians, for example helping to found a cadet corps, the first such institution in Serbia. Your Holiness, we also recall how 23 years ago you visited this cathedral together with Patriarch Pavle. I recall my predecessor at that time, Archbishop Anthony (Medvedev). He always reminded us of the much-suffering Serbian people, how we, Serbs and Russians, are brother Slavs. We always remember and will never forget it. Your Holiness, on this day, on behalf of our Diocese, allow us to award you from with the Order of Saint John of Shanghai and San Francisco the Wonderworker of the First Degree. 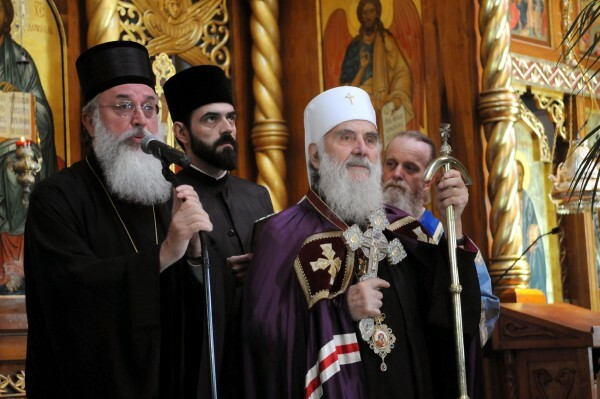 Your Eminence Archbishop Kyrill, honorable fathers, brother and sisters: the Russian and Serbian peoples throughout history have not only had a common Faith, but they have been true brothers and sisters. So it has been in the past. And, glory to God, so it is today. Many would like to see Serbia separated from Russia, to break up the filial love between brothers. But, this is impossible. We have been and remain brotherly peoples. Of course, we can never forget Holy Martyr Nicholas II, who during the World War I helped Serbs who were undergoing the so-called “Albanian Golgotha.” He performed such a great deed that it cost his life and the life of the Russian State. At that time he told the Western allies that if they did not extend assistance to save the Serbian people from the Albanians, he will no longer be your ally. He gave such an ultimatum. I would like to underline today that after the October Revolution, the Serbian people accepted not only the Russian aristocracy, clergy and scholars but the simple people as well. Of course I am certain that this love, friendship and unity will always remain as before. I am personally very grateful to God that I am in this cathedral for the third time and am able to venerate the honorable relics of St John, who for quite some time lived and served the Church in Serbia. Of course, many knew him from that time and recall him and call upon him in prayer. How he lived in Serbia in modesty, simplicity honesty and purity and full of love and God’s grace. You know that he was a professor in seminary in Bitole. I have met many priests and professors who recall St John as their own professor, how with great love and knowledge he taught the science of theology. Glory to God, we here again in order to request of St John his holy prayers for the Russian and Serbian Orthodox peoples, and all peoples, so that his prayers will protect us and so that his spirit guide our life, both civil and ecclesiastical in this difficult and complicated age. May God bless our Orthodox peoples and all peoples, who make an effort to live according God’s law, you and us always now and ever and unto the ages of ages. Amen. To you, dear Vladyka, I gift to you this icon of St Nicholai of Ochrid, who knew Saint John and loved and respected him greatly. St John lived under the omophorion of St Nikolai when he lived in Serbia. It was in Russia that many of the recently-glorified Serbian Orthodox Saints, like St Nicholas of Ochrid, St Sebastian of San Francisco and Jackson, St Mardareje of Libertyville and Chicago and Patriarch Varnava of blessed memory received their theological education and in particular their spiritual formation coming into contact with the rich, centuries-old Russian Orthodox heritage as well as with their holy counterparts in Russia during the days of their studies there. In turn, the Serbian Orthodox Church and its people received the masses of Russian refugees who lost their homes and homeland in the Russian Revolution of 1917. The Serbian people were hospitable and generous. St John himself participated in the life of the Serbian Orthodox Church, which contributed to his own spiritual formation, and while a hieromonk was consecrated a bishop there.